The Natural Challenge: Switching to Natural Makeup Easier then I thought! Welcome to the June 2013 Natural Living Blog Carnival: A Natural Challenge. This post was written for inclusion in the monthly Natural Living Blog Carnival hosted by Happy Mothering and The Pistachio Project through the Green Moms Network. This month, our members took 1-2 weeks to explore a natural practice that they had yet to try. Today, they’re going to tell you about their experience! Hopefully, you’ll find some inspiration to try something new on one or more of the posts. One thing you should know about me is I am a “makeup girl”! Not because I think I’m ugly and need it; it’s just how my mom raised me. She always told me to never go out in public without a little something on, and she never does and neither do I. I feel so weird if I don’t have at least eyeliner on. Ok, I will go through a drive thru….but with sunglasses on! So this challenge was a very scary idea for me. I have already given almost everything else in my house a “Green Makeover”, and have been putting this one off for 2 reasons: 1. I didn’t want to just throw away my old “not so natural” makeup and 2. I was afraid…very afraid of my “natural” makeup face! To get started I did research on which makeup to choose. I started at the Environmental Working Group’s Skin Deep Cosmetic Database to find a makeup with a low rating for the hazards of ingredients. I also read the ingredients on my own. 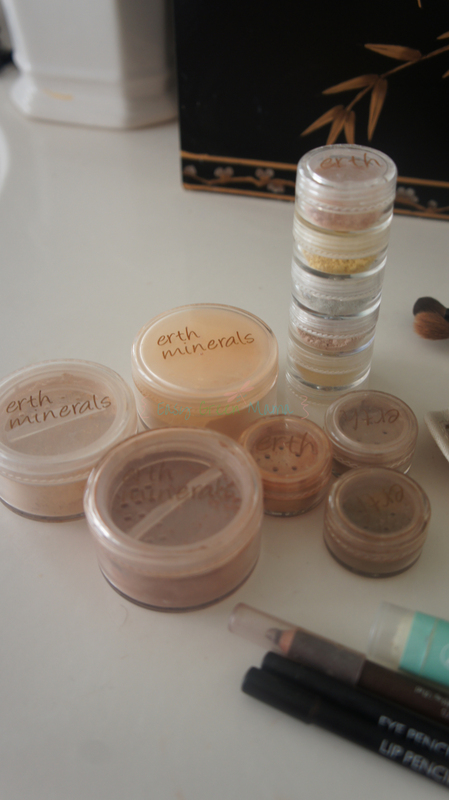 I decided to go with the brand Erth Mineral Makeup. The ingredients are minimal & natural and the prices were very reasonable. They were offering some good deals that I took advantage of…of course! •free mineral makeup samples of foundations and veils with a minimum order. •With any order over $25.00, receive 2 free samples! The package arrived nicely packaged and carefully wrapped in pretty tissue papers. The packaging had a small business feel, which I personally like. I usually wear liquid foundation and loose powder. I had to get use the mineral make up twirl, tap, brush technique, but I got it down pretty easily . I like to use a concealer stick; I substituted that with Mineral concealers. You have to figure out which Mineral concealer (5 different colors) is right for your needs and skin tone. I opted for the concealer sample kit so I can figure it out by trial. I also switched all my pressed eyeshadow and blush for a mineral makeup. Turns out my pencil eyeliner, browliner, and lipliner scored well on EWG’s Skin Deep Cosmetic Database so I didn’t have to replace those. I never wear mascara or lipstick (just chap stick, sometimes with a liner for color). 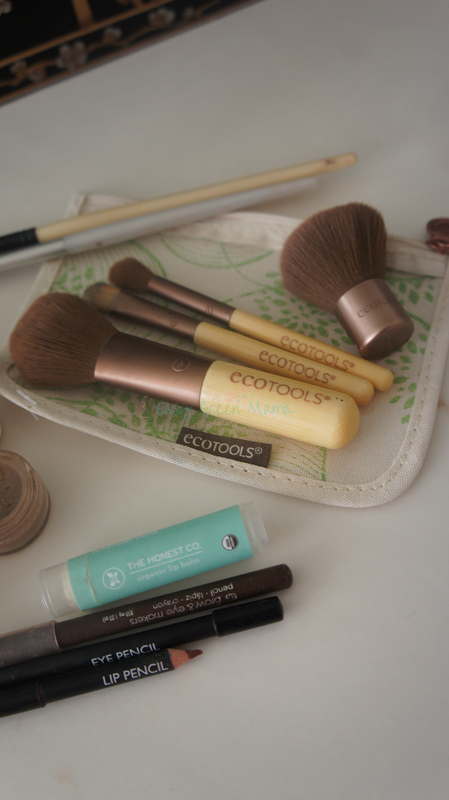 I also purchased natural brushes that I would need for my mineral makeup from Ecotools. I really love it! The first few days my face was actually breaking out more, but I think it’s because my face was detoxifying. My face was able to push out all that oily yuck from my old “not so natural” makeup….gross! It’s been almost 3 weeks and my skin looks better then ever! I have always had black head and pores on my nose, but not now! My pores are so small on my nose and I have hardly any black heads. I never thought it was possible, no matter how much I cleaned my face before. The coverage is great and I have a pretty natural look! I am happy with all the products I purchased and I am defiantly converted to natural makeup only! It was so easy really, not much of challenge after all! Here’s a recent picture with my natural makeup on. I was not compensated for this post. All opinions are 100% my own. Visit Happy Mothering and The Pistachio Project to learn more about participating in next month’s Natural Living Blog Carnival! I used to only wear mineral makeup, but stopped for some reason a while ago – you look great with it, and you’ve inspired me to look into it again. I love the eyeshadow; really gorgeous!! I love the eyeshadow better then my not natural makeup! I was surprised to find they offered mineral eyeshadow with sparkle in it. I like a lil shimmer! The mineral make up looks great on you! I don’t wear make up hardly at all unless I’m attending a funeral or wedding (or family professional pictures) but great article! Jessica I’m jealous of women who can go without makeup. But I just can bring myself to do it. I guess my mom planted a deep seed in me on this subject! You look great! I have the same problem. I wear minimal makeup because I don’t want to keep buying the :bad” stuff but I can’t find a good one I like either. You look lovely. I’ve bee reading about different ingredients in make up and learned I want to stay away from most brands. I’ll have to look into Erth Mineral make up. Thanks. Thanks for sharing. I’m using up what I already own, then I’m planning to switch. Beautiful picture with the kiddos, very fresh and pretty! Great to read a review, and love hearing about how your skin cleared up. My dermatologist warned me that powders would clog my pores years ago so I’ve always shied away from them, but maybe it’s time to try again! I love mineral makeup! I’ve never heard of Erth Mineral Makeup before, but I’m going to have to try it out. And don’t worry, my mom also told me not to leave the house with just a little makeup on. I was the only teenager whose mom didn’t mind her wearing makeup! Thanks Jennifer! I knew I couldn’t be the only one! Like you, I was happy that switching to a natural makeup was so easy. I didn’t feel like I was settling on subpar stuff just because it was natural. Defiantly not sub par results. So glad I made the switch! Glad to hear you had a good experience! I rarely wear makeup, but when I do it’s definitely natural. 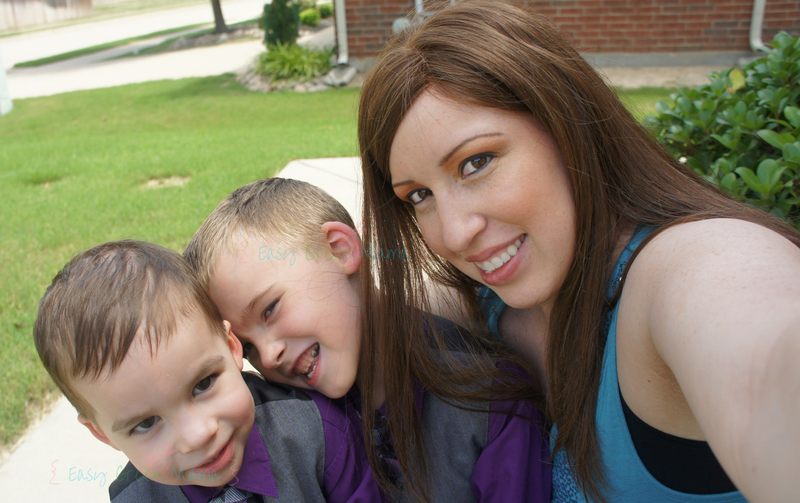 I switched to natural makeup when I was pregnant with my first child almost 6 years ago – wow time flies! I recently switched to natural make-up too. I love it! I switched to Afterglow Cosmetics, but Erth seems way cheaper. I’ll check them out when I run out of my current make-up. I had the same experience, my skin broke out a little at first, but now it’s so much better. Yay! I’m glad to hear you had the same experience with the break out part. I’m not 100% sure if that was why I broke out but I’m pretty sure it was! Glad I could offer you a cheaper option. I want to be natural but I want to be frugal too! P.S. Your make-up looks great! I don’t wear any makeup, but if I do need to dress up I keep it simple at mascara only. Thanks for giving me options! Thanks for the suggestions. This is one natural living switch I haven’t made yet. I know what you mean with the acne! I hope if you end up trying mineral makeup it works for you too! You look great! I need to stock up on some natural makeup solutions. I have some good mineral powder… thats about it. 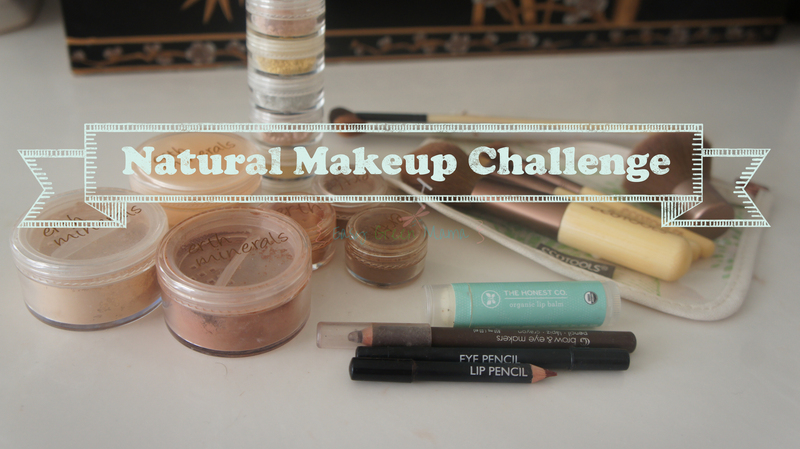 I love this challenge and I will definitely look into all natural make up. I will also have to go to this environmental groups website and see how my products rate! I’d really love to try this. I really dont wear makeup much because it either makes me itch uncontrollably, break out, or turns orange. I’d love to find a basic foundation and blush i can tolerate for more than an hour or so.